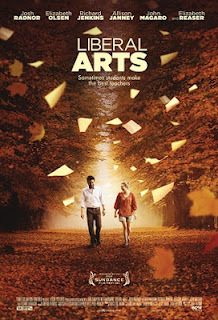 LIBERAL ARTS is a trite, cliché-ridden, entirely unbelievable movie that runs too long, and bores during its run-time. Written by, directed by and starring Josh Radnor aka Ted in HOW I MET YOUR MOTHER, the movie reads as a mash-up of rom-com set pieces, with pretensions at saying something more profound. That profound insight is basically that most of us reach a point where we're happy in our small contained world, and once we leave it, life is basically a series of disappointments. For some kids, that'll be high school. For others, when they leave college. For some lucky folk, it's when they retire. The point that the movie wants to make is that no matter how tempting it is to go back to that place of nostalgia, it isn't healthy. You have to move on and grow up. All of which is fair enough. I can relate. That could've been the backbone of an interesting movie. But what we get instead is half a film showing a soupy meet-cute and falling-in-love story between Radnor's 35 year old arrested development book-worm and Elizabeth Olsen's 19 year old Liberal Arts college student. They share music mixes and feel uplifted by Schubert! To make this bearable, Radnor needed to be a lot more self-aware and ironic with the material than he was. The second half of the movie zings all over the place, with one plot twist involving Olsen that rang hollow - another plot twist featuring a depressed student called Dean ( a very impressive turn by John Magaro - want to see more of him) that seems to come from another film altogether - and so many resolutions and endings that the film drags itself out worse than RETURN OF THE KING. In the midst of all this, Richard Jenkins' reluctantly retiring Professor gets too little screen time. Allison Janney's brilliantly acerbic Professor gets just enough but steals the show. And Zac Efron has a charismatic cameo. But all this does is to reinforce the feeling that what we have here is an ill-written jumble of scenes, some of which work, some of which don't - a hammy sensibility aiming at something better. All of which is coupled with a pretty basic technical package. LIBERAL ARTS played Sundance and Sundance London 2012 and will be released in Australia on September 20th 2012.